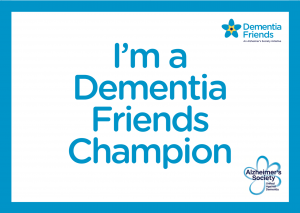 I am delighted to announce that I have completed my Dementia Friends Champions training. The idea of the training is to enable Dementia Friends Champions to help people understand what it’s like to live with dementia and the actions they can take in their communities to make them more dementia friendly. The ambition is to create a network of a million Dementia Friends across England by 2015.